Visit the new Henry J. Stumpf International Wheat Center, tour wheat variety trials, and learn about research-based water-saving practices at the West Central Water and Crops Field Day. 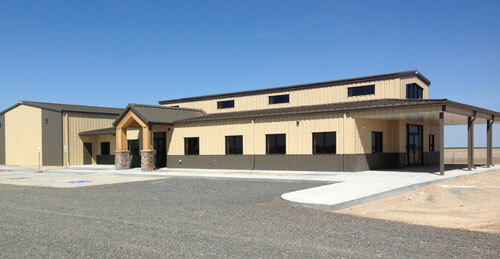 Henry J. Stumpf International Wheat Center near Grant was built in 2014 after Marvin Stumpf donated $1 million and a section of land for the facility. Geared to western Nebraska conditions, the center is a base for research, education and demonstration work on wheat-based dryland and irrigated cropping systems. The event will be Tuesday, June 23, at the new wheat research and extension facility near Grant and is presented by the UNL Institute of Agriculture and Natural Resource's West Central Research and Extension Center. The days events will begin with registration at 8 a.m., and a welcome by Don Adams, district director of UNL's West Central Research and Extension Center at North Platte. Afternoon tours will end at 3 p.m. The wheat center was built in 2014 after Marvin Stumpf donated $1 million and a section of land for the facility. Geared to western Nebraska conditions, the center is a base for research, education and demonstration of wheat-based dryland and irrigated cropping systems. The field day will offer participants an opportunity to learn about the latest research and view field scale work to maintain or increase crop yields while conserving water. The day's events will include speakers in the morning and field tours in the afternoon, including a tour of more than 50 wheat variety trials being conducted at the center. Wheat Variety Tour — UNL wheat breeder Stephen Baenziger will discuss his international wheat breeding program and upcoming varietal releases. Chris Hansen of WestBred and Gerardo Rivera-Collazo of Bayer Crop Science will discuss their wheat breeding programs and varieties. UNL Extension Crops Specialist Bob Klein will discuss the University of Nebraska State Variety Trial which is part of state-wide testing. Growers will be able to visit current and future varieties at the site. Mobile Pesticide Application Technology — Greg Kruger, UNL Weed Science Specialist. A brief overview of pesticide applications, nozzles, and application methods will be presented from the Mobile Spray Lab. Participants will have the opportunity to see several nozzle types, the spray patterns they produce, and the role they play in both efficacy and off-target movement. Discussion will also cover pesticide application practices including pulse width modulation and spray hoods. Understanding Soil Biodiversity for Managing Insect Pests and Plant Pathogens — UNL entomologist Julie Peterson and plant pathologist Tony Adesemoye, both of Nebraska Extension. Cropland soils are home to a diversity of living organisms, some destructive and some beneficial. Nebraska Extension is exploring this biodiversity to find beneficial organisms that may provide biological control for western corn rootworm and charcoal rot disease in soybean and corn and stem blight in dry bean. The field day is free, but participants are asked to register by Friday, June 20, so appropriate plans can be made for meals, resources, and meeting space. To register, email (phyllis.carney@unl.edu), fax (308-696-6780), or call in (308-696-6740) the following information: name, address, affiliation or business. CCA credits have been applied for in soil and water.